During our Back to School conference, all attendees were invited to a contest: tweet or post on Google+ using the hashtag #HISDBTS. Last week, our team surprised these winning teachers with prizes donated by some of Huntsville's best businesses. Click photo to enlarge, Click enlarged photo to advance through slideshow. Maria Avila (center) pictured with Principal Rosa Valles and Assistant Principal Albert Archuleta. Maria won a gift certificate to Olive Garden. Augusta Russell (center) pictured with Principal Rosa Valles and Assistant Principal Albert Archuleta. Augusta won a gift certificate to Los Pericos. Freda Shaw (center) pictured with Amy Mayer (left), Director of Staff Development and District Initiatives, and Principal Koren Nicks. Freda won a gift certificate to Olive Garden. 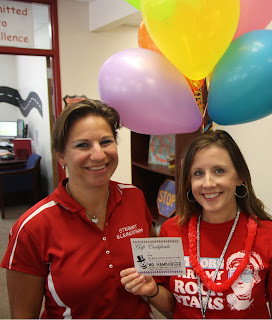 Randi Jo Barndt (right) pictured with Assistant Principal Susan Cryer. Randi Jo won a gift certificate to Mr. Hamburger. Amanda Fisher (center) pictured with Principal Delanise Taylor and Amy Mayer. Amanda won gift certificates to Olive Garden. 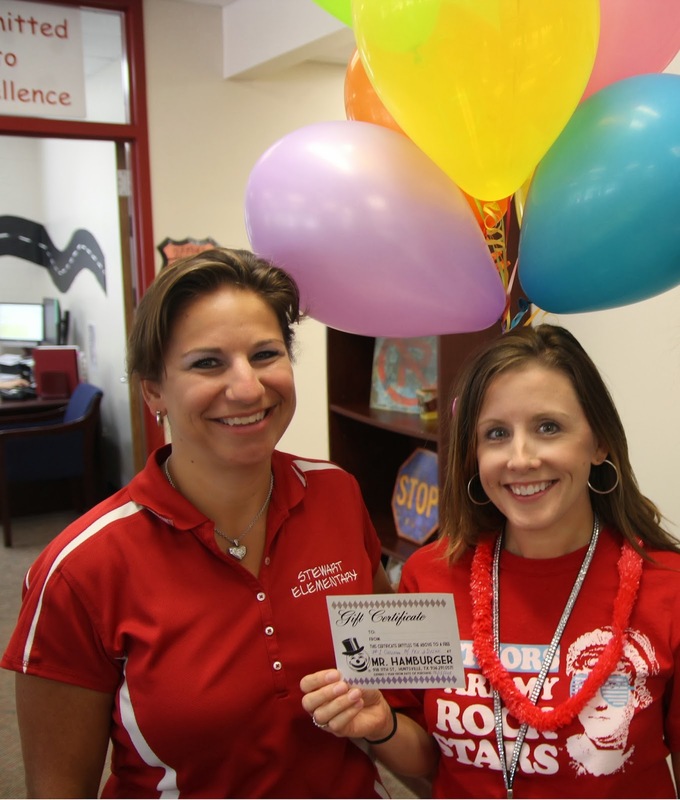 Kimberly Johnson (left) pictured with Principal Amber Rodriguez. Kim won a gift certificate to Mr. Hamburger. Brad Didier pictured with Amy Mayer. 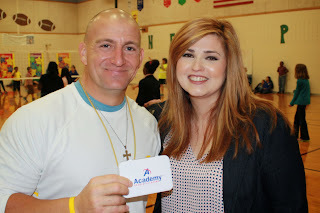 Brad won a gift certificate to Academy Sports. Heather Levine pictured with Principal Ivan Velasco and Amy Mayer. Heather won a gift certificate to Walker County Hardware (Ace Hardware). Theresa Scruggs pictured with Principal Ivan Velasco and Amy Mayer. Theresa won a gift certificate to Fiesta Taqueria. Paula Guthrie pictured with Principal Ingrid Purvis. Paula Guthrie won a gift certificate to Fiesta Taqueria. Shelly Petkovsek pictured with a bunch of her students and Principal Ingrid Purvis. Shelly won a gift certificate to Walker County Hardware (Ace Hardware). Jason Teel pictured with Amy Mayer and Principal Ingrid Purvis. Jason won a gift certificate to Walker County Hardware (Ace Hardware). Terry Cates pictured with Assistant Principal for the EXCEL Program Christell Marshall (left) and Principal Ingrid Purvis. Terry won a gift certificate to Walker County Hardware (Ace Hardware). Barbara Lesikar pictured with Amy Mayer and Principal Beth Burt. Barbara won a gift certificate to Walker County Hardware (Ace Hardware). Warren Sievert pictured with Principal Beth Burt and Amy Mayer. Warren won a gift certificate to Walker County Hardware (Ace Hardware).